When it comes to image editing, I'm a big fan of free and open-source Photoshop alternatives like GIMP and Paint.NET. On the other hand, I'm also a big fan of software that lives inside your Web browser, which is why I'm increasingly turning to Sumo Paint for my image-editing needs. 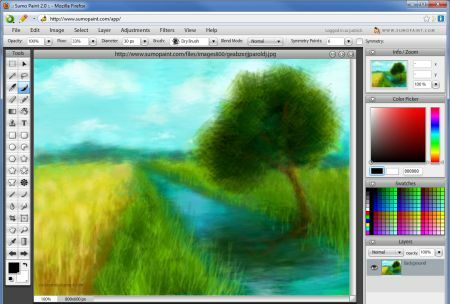 Sumo Paint is not only free, but also entirely browser-based. There's nothing to install (except for Adobe AIR, which is the platform on which the software was built); you just head to the Sumo Paint site and sign into your account. From there you're treated to a gorgeous interface stocked with enough tools to make Photoshop jealous. Sumo Paint's features include everything from 3D filters to clone stamps to blur and smudge tools. In other words, anything Photoshop can do, Sumo Paint can probably do just as well. (Okay, the latter lacks some of the former's more advanced features, but not many users need those.) The service even provides online storage for your work, though it's anybody's guess how much space you get (I couldn't find that information anywhere in the help pages or feature lists). There's a Pro option (about $30 U.S.) that includes an offline version of Sumo Paint, among other features, but I think most users will be more than satisfied with the free version. Thus, if you're looking to create or edit images of any kind and don't want to clutter up your PC with yet another program, I can't recommend Sumo Paint highly enough. It's really quite amazing.